Pyrex Bakeware Is Durable, Transparent For Easy Monitoring Of Baking Progress And Provides Good Heat Conduction For Even, Consistent Baking. There’s No Substitute For Pyrex, The Original Glass Bakeware. Pyrex 6 Piece Mixing Bowl Set Includes 1 Each – 4 Quart Mixing Bowl With Red Plastic Cover, 2 1/2 Quart Mixing Bowl With Blue Plastic Cover And 1 1/2 Quart Mixing Bowl With Orange Plastic Cover. Pyrex Glass Is Safe In The Oven, Microwave, Refrigerator, Freezer, And Dishwasher. Pyrex Glass Is Non-Porous, So It Won’t Absorb Food Odors, Food Flavors Or Food Stains. Clear Glass Allows You To Watch Your Food As It Cooks. Limited 2 Year Warranty On Pyrex Glassware And 1 Year Limited Warranty On Covers And Accessories. Made In The U.S.A.
Pyrex Bowls – easy stack for storage, easy to store in refrigerator, and easy to take meals to a friends house. The lip and shape of these bowls makes it easy to hold while mixing. I use vintage pyrex daily and have for 30 years. 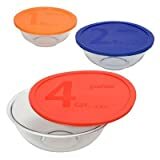 Ordered these because having a lid for food on the go is great. Perfect assortment of sizes for a variety of foods. And for those negative reviews I have read on amazon. PLEASE READ HOW TO USE PYREX. Yes, Pyrex can go from stove, to refrigerator, but not immediately; let it settle to room temperature. Of course it would crack. And when using pyrex in the oven, don’t add cool liquids to hot dish – warm the liquid first – Again, only logical that the dish would crack with temperature extremes. I have experienced 1 broken pyrex dish in 30 years because of thoughtlessly adding cool water to a roasting dish. Same goes for the vintage glass coffee pots, (not a coffee maker pot) which I use daily on my stove. PYREX – AMERICAN MADE – YEA! I broke two of our stand-by Pyrex bowls and needed replacements. I couldn’t find the exact same ones any longer, so these don’t fit my organizational scheme in my cupboard. The largest one is a good size, but my cupboard door hits it now. A small price to pay for a large glass mixing bowl with a sturdy lid!